We have returned home from a wonderful week of vacation on the Outer Banks of North Carolina. 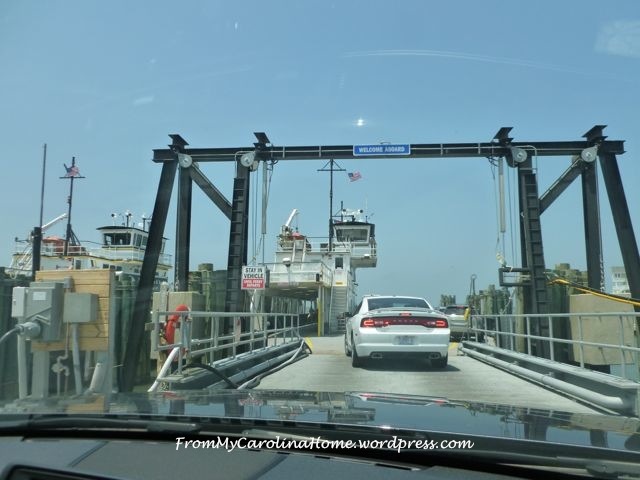 DH and I spent the entire week working our way from Currituck to Wilmington. Now, I know there are not many things more boring than other peoples vacation photos, and I promise not to bore you with the over 250 pictures I took in seven days. I do want to share some interesting things about our trip, and the Lighthouses are at the top of the list. Although it was raining the day we set out, we didn’t let that stop us. 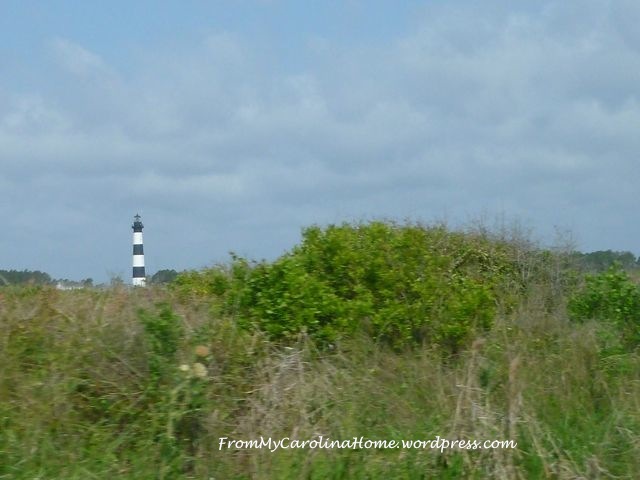 We started out on the north end of the barrier islands in Corolla at the Currituck Lighthouse. It was here that we discovered that the painting of the lighthouses are all unique, each one different, so they can be identified from the ocean during daylight hours. 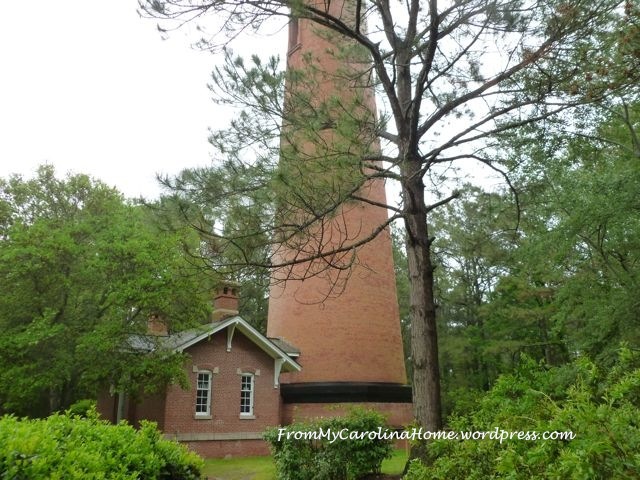 Currituck was the last one constructed, so it was left unpainted. It is easier to see all the brickwork on this one. On the inside, a spiral staircase runs up the sides, with landings every so often for a little rest. The lower landings have history lessons to read while resting. We learned that the night time flashing pattern was unique to each lighthouse, Currituck is 3 seconds on and 17 seconds off. This was so mariners could tell exactly where they were when approaching the NC coast in darkness. That was a new fact for me, I thought they all just flashed lights in no particular pattern. 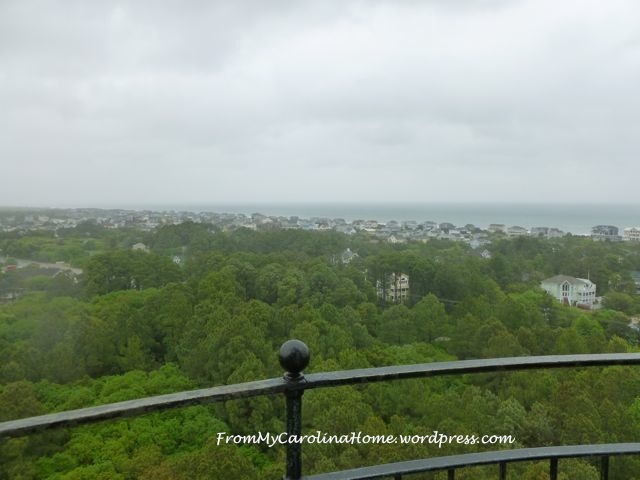 Halfway up the 220 steps, the view is already lovely, even in the rain. 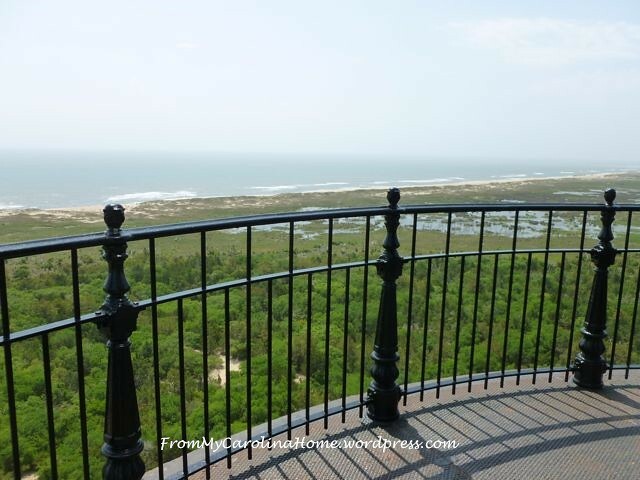 Gorgeous views all around from the top observation balcony. 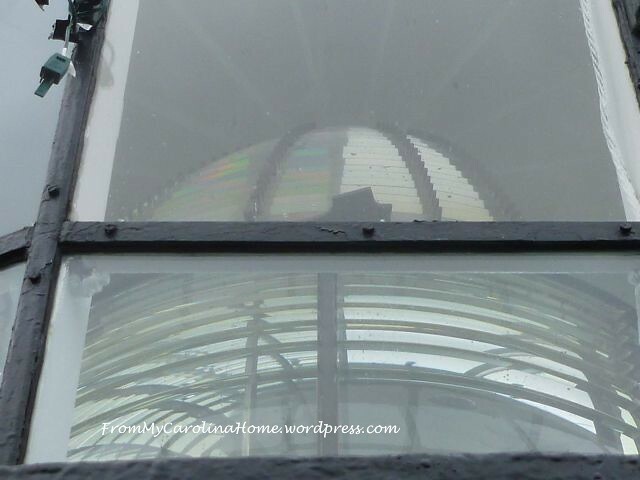 DH was really interested in the Fresnel lens which was fully restored. Unfortunately, they didn’t let us get to the lens room. 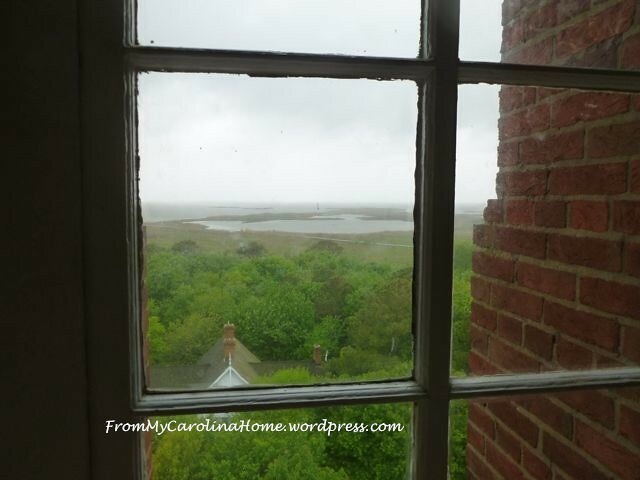 From there we took a drive down the barrier islands, hoping to see the Bodie Island lighthouse next. But, alas, it wasn’t open. The horizontal stripes identify it during the day. Then it was on to Cape Hatteras the next day with its distinctive spiral pattern. We were surprised to learn that the lighthouse had been moved in 1999 due to the erosion of the land. 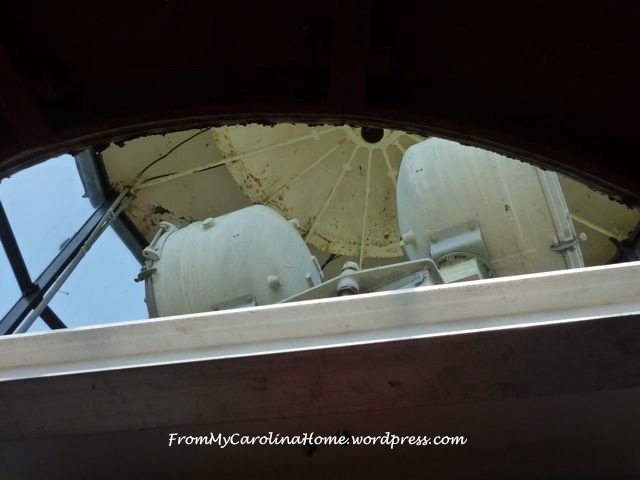 The story of that is fascinating, and you can read the entire thing at Moving the Cape Hattaras Lighthouse. 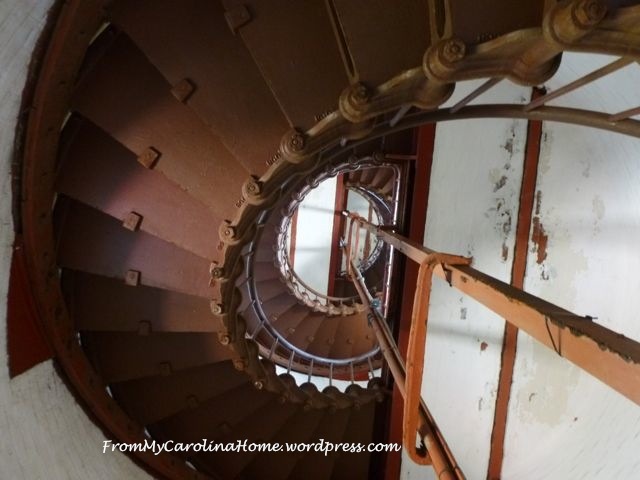 The same spiral staircase was here too, with 257 steps to the top of the tallest lighthouse in the US, at 208 feet tall. Modern lights allow the beams to reach 20 miles off the coast. 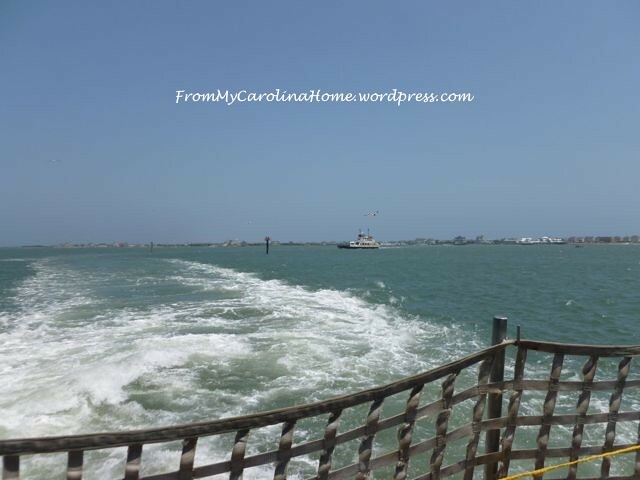 We then got on our first ferry ride for the day, a one-hour cruise to Ocracoke Island. This was so much fun! Watching the other boats come and go around us while we motored over. 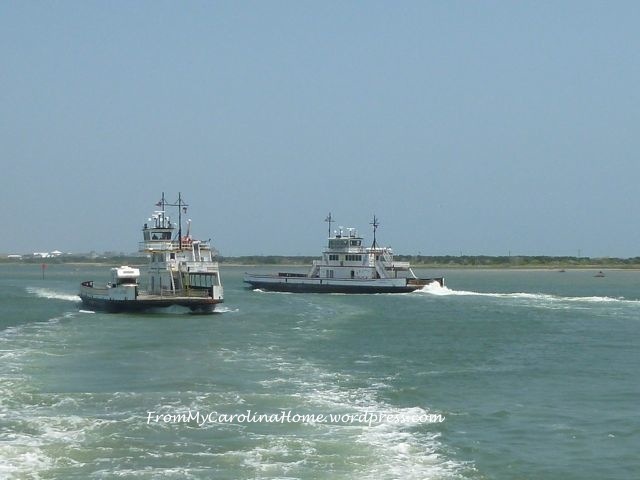 We couldn’t get to the Ocracoke Island lighthouse because of road construction. 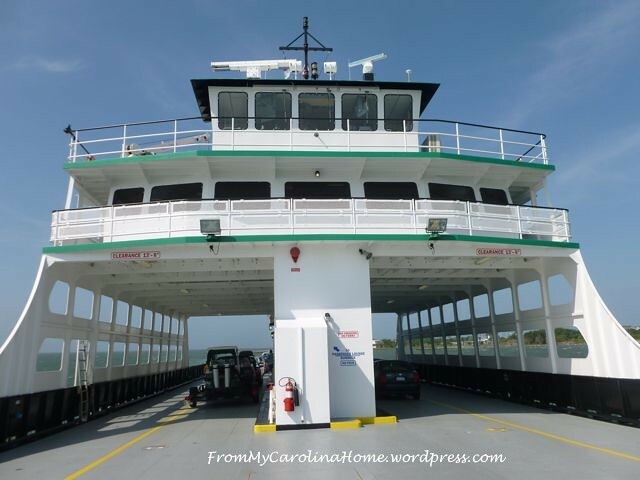 We were wary that we couldn’t get in and back out again in time for our scheduled ferry crossing to Cedar Island and we were booked on the last one of the day. That was OK, visitors aren’t allowed inside this lighthouse right now, so we piddled around in the museums until time for the ferry crossing. This ferry was twice the size of the other one, and we had a 2 hour and 15 minute crossing time. I watched the sea, and the birds for a while, then read a book while we were out of land sight. 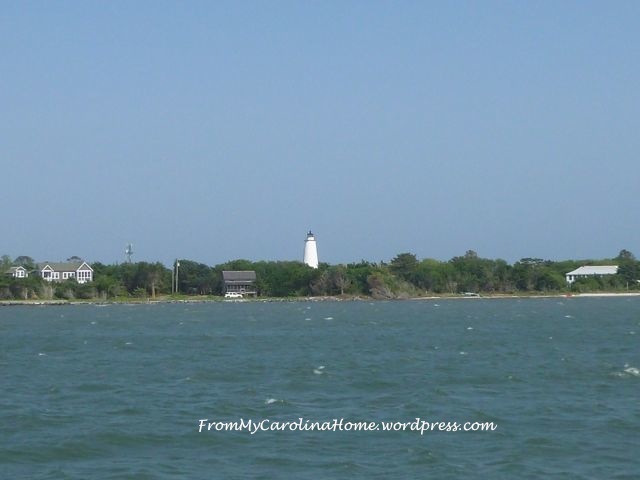 I did manage to get a pic of the Ocracoke lighthouse from the ferry. Its daytime paint is solid white. 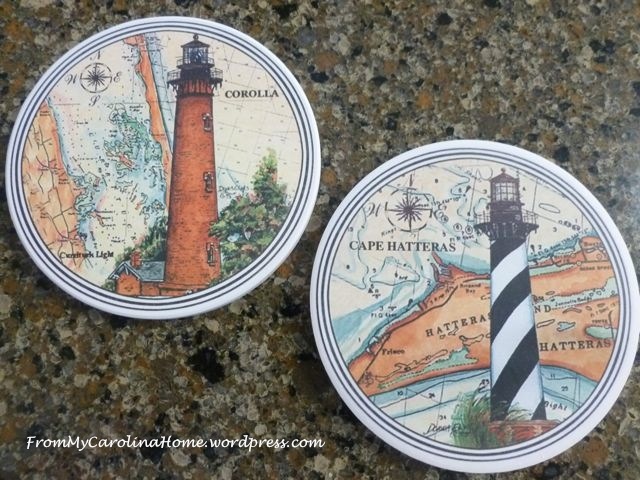 Although I really dislike souvenirs in general, we did get two coasters to commemorate the two lighthouses we really did climb. Since they are North Carolina landmarks, I think they go well in our home. Have you ever been to a lighthouse? Our family always enjoys seeing or climbing the lighthouses. Most of them have very interesting histories too. I enjoyed seeing yours as we have not been there before. I love lighthouses. 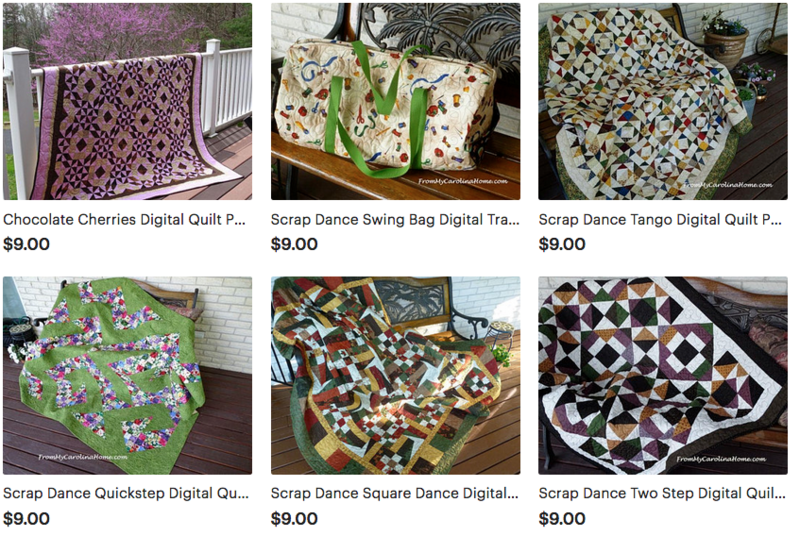 Thanks for sharing – these are really neat! I’ve spent summers on Cape Cod, and have been to Nauset Light (and the three sisters) multiple times. It used to blink three white beams (to represent the original from the three sisters), but was changed many years ago to be a red and white flash. I miss the old pattern! Thanks for the great pics.I have been to a lighthouse called Torre de Hercules,Galicia-Spain.I agree, the views are fabulous! I have been to the Cape Leeuwin and Cape Naturaliste Lighthouses. The Cape Leeuwin is on the point where the Indian and the Southern Oceans meet. We were in the USA last November, and we went to the Owl’s Head Lighthouse, in Maine. I love Lighthouses. I think it is because the coast always seems so wild and free. Thanks for your story. 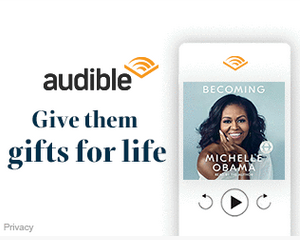 Actually I’ve been the exact same four you showed. 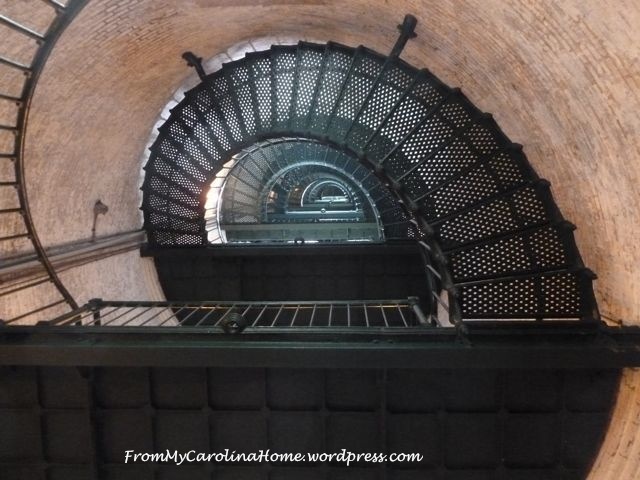 I’ve only climbed Hatteras. My dad’s family is from North Carolina, and my sister and I loved visiting the Outer Banks when we went to see them. In fact we’ve been talking about going back. Love the pics..thank you for sharing. 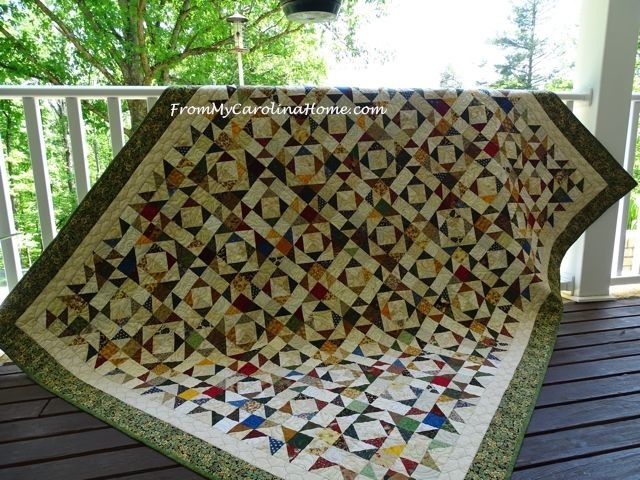 Mary Turner, a local quilter, made a quilt featuring lighthouses a few years ago that was just gorgeous. Lighthouses have a special allure, for some reason….evocative of exciting shipping days gone by, windswept rocky coastlines, etc. I fell in love w/ them in New England. 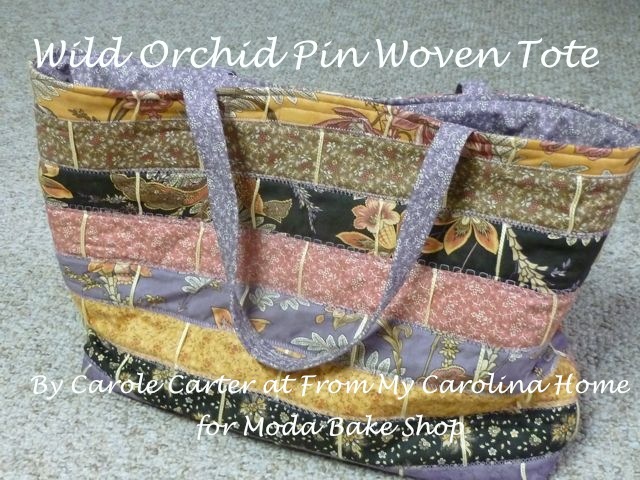 Thank you for sharing your photos! Thanks for sharing your pictures. 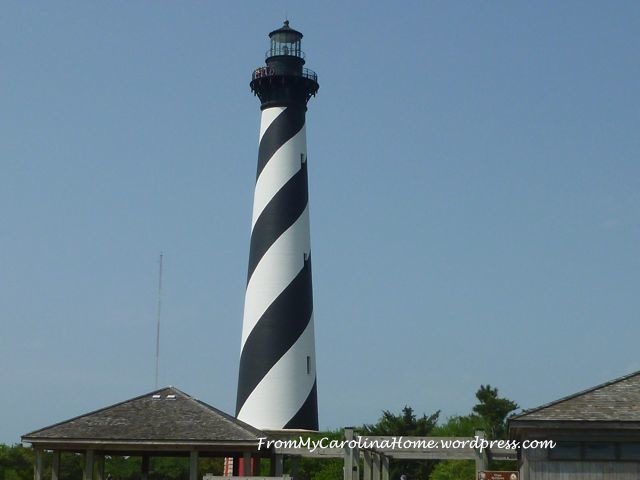 I enjoy visiting lighthouses and have been to many in New England and Cape May, N.J. There are twin lighthouses on Thatcher Island in Rockport Mass. that are accessible by boat only. Great views. What a fun trip…thanks for sharing! Wow, lovely photos. My son in laws family is from Cedar Island… or something like that. I know he grew up there. I think his parents have an old house there. Light houses are so cool. I love the Outer Banks! 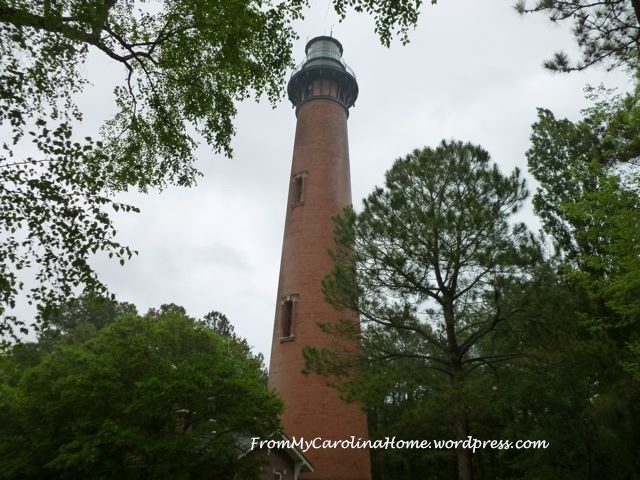 We have made several trips on the motorcycle up and down the Outer Banks and have visited all of the lighthouses out there. It is a wonderful place to visit. 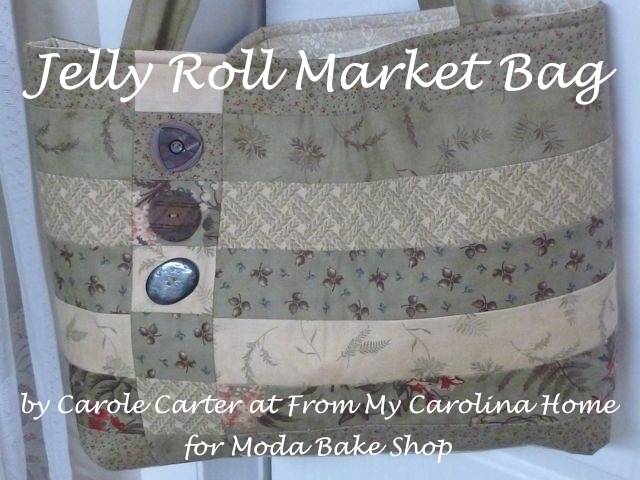 I love calling North Carolina home! Lovely story. Thanks for sharing. I’m not sure that we paint our light houses in different patterns here in Australia. I have been to a few, but most have been historic monuments, and either no longer in use or unmanned and not open. There usually is a stunning view. 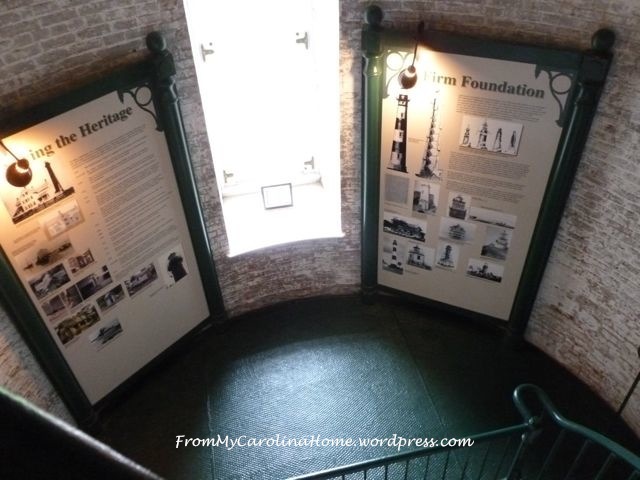 Dear Carole, before I forget I wanted to let you know, I think the pictures you took of the stair cases in the light houses are Spectacular!!! I love architecture, but these 2 pics are just incredible. Wow! It knocked my socks off! So glad I met you on paperback swap!! Thank you for sharing. I am one of those people who actually likes to see other people’s vacation photos! 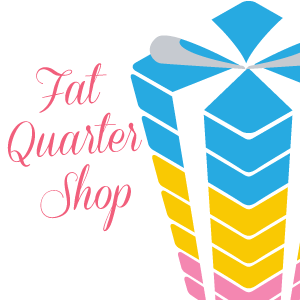 It really is a great way to learn about a place when you are trying to plan a vacation! My best friend rented a house in the Outer Banks for this summer so I will show her this. Beautiful area! I have only been to one lighthouse – the Barnegat Lighthouse on Long Beach Island New Jersey. I chickened out when it came to climbing to the top, though! 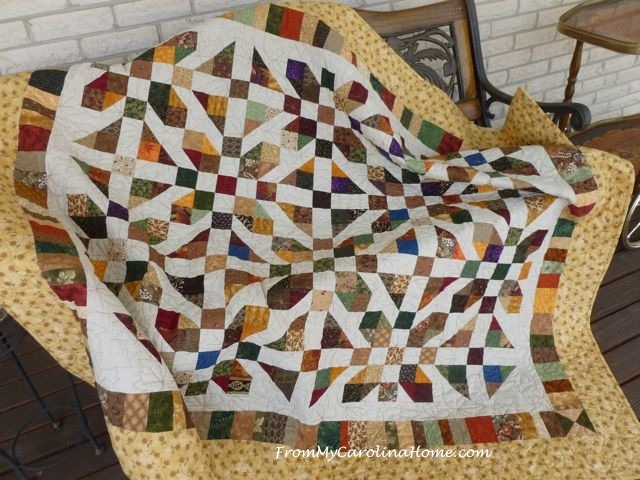 Thanks for linking up to my Spring Break Link Party! I love lighthouses! Hatteras and Currituck are my favorites. 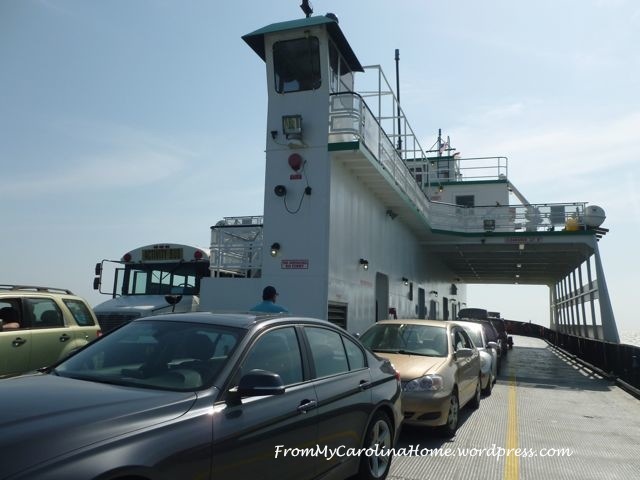 Seeing these photos makes me long for another trip to the Outer Banks.